One Postcard a Day: A Detour or a Scheduled Stop? 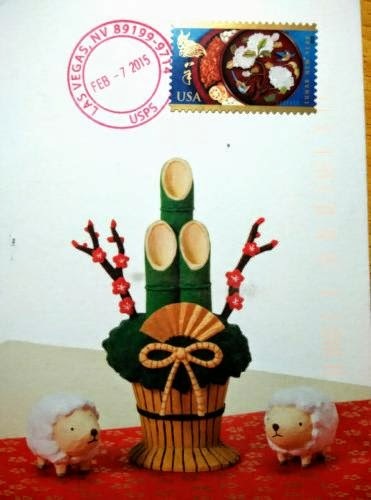 Postcard US-3223129 to Czech Republic was one of those Chinese New Year cards that got a USPS the Year of the Ram stamp and a hand-canceled postmark at a post office counter in Las Vegas on the first-day-of-issue February 7, 2015. However, an extra automated postmark revealed that the postcard had passed through a processing distribution center in Dallas, Texas. According to the USPS handbook, "advanced facer canceller systems used by processing distribution centers cancel letters quickly. These machines are equipped with biohazard detection systems so letters postmarked by automation benefit from added safety measures." 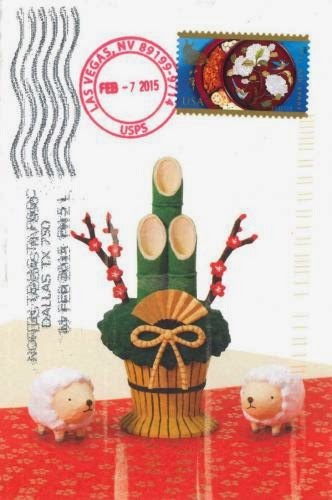 Other cards mailed on the same date such as US-3208613 to China or US-2651107 to Taiwan did not get an extra postmark.